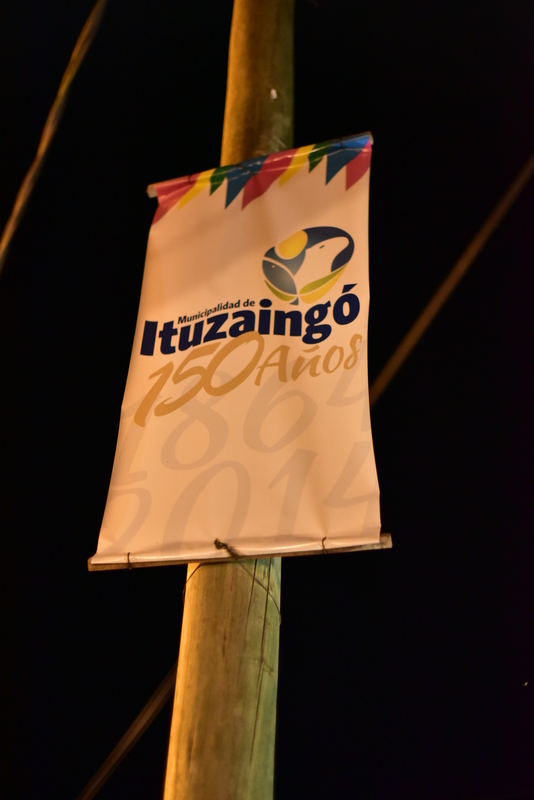 In case you hadn’t already figured it out, it’s summer here in Ituzaingo. 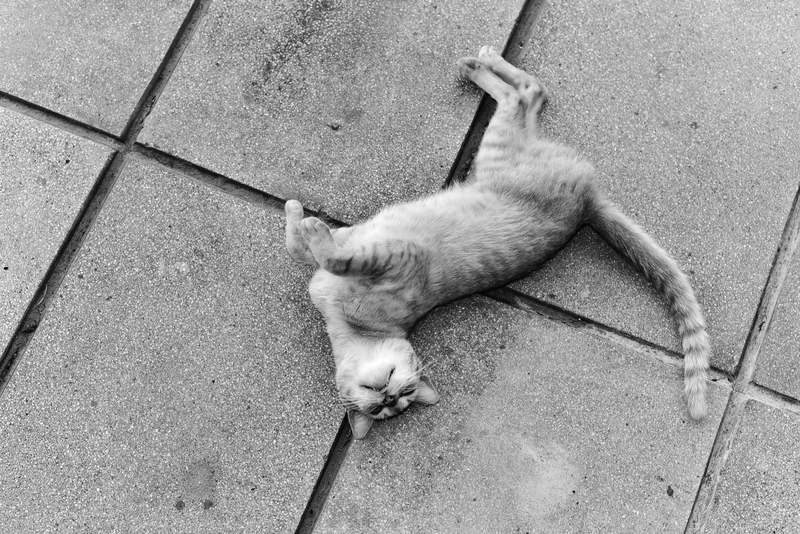 This means the afternoons are long, hot and lazy–the perfect time for a siesta! (However, since we work American schedules, that’s not much of an option for us…) What it also means is our little town comes alive with tourists. 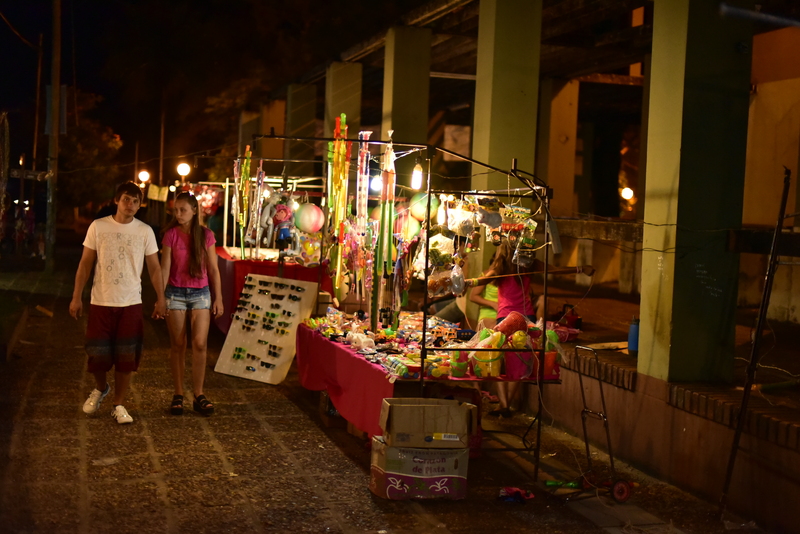 The town plaza that previously only held a few scraggly boys chasing a dog now holds hundreds of families, dozens of vendors, and even a circus or two. 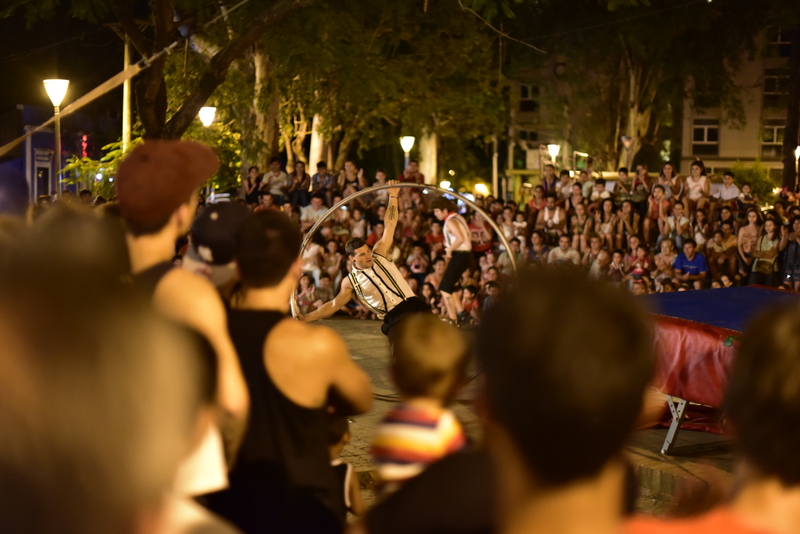 These are not the three ring, Barnum and Bailey extravaganzas–it’s more a few friends with some otherwise out of place talents coming together each night and putting on a pretty professional show. 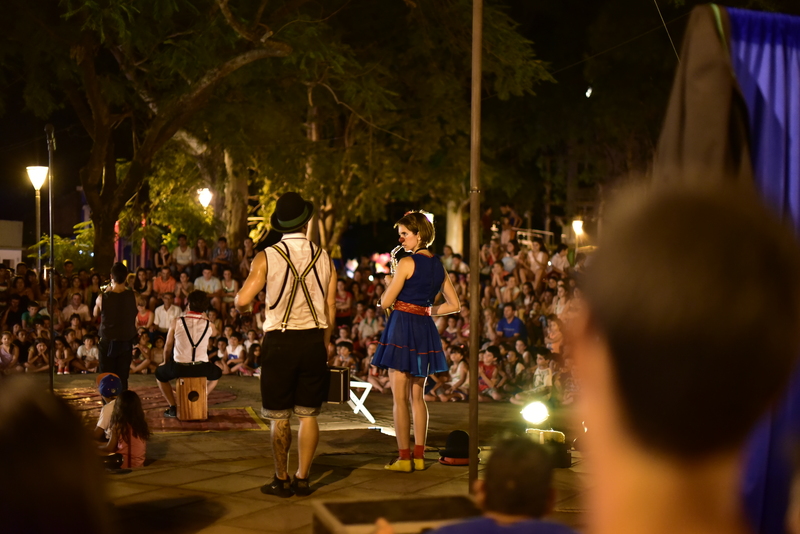 We recently found out that the town doesn’t even pay the circuses to come to town–they just load up their van and set up their stage every night (with the mayor’s permission, of course) in the hopes that the tourists will drop enough pesos into their hats to keep going for another season. 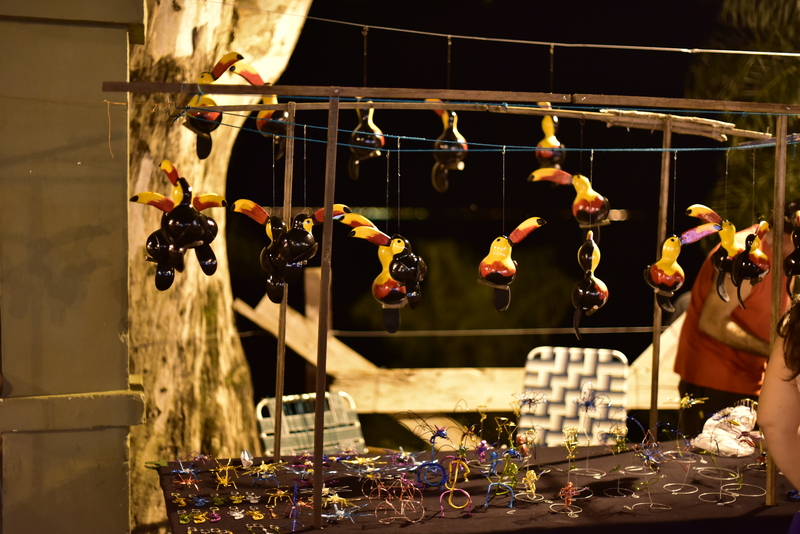 There are all sorts of vendors around town as well, congregating in little groups of dreadlocked hippies and bohemians with a diverse array of wares to sell. 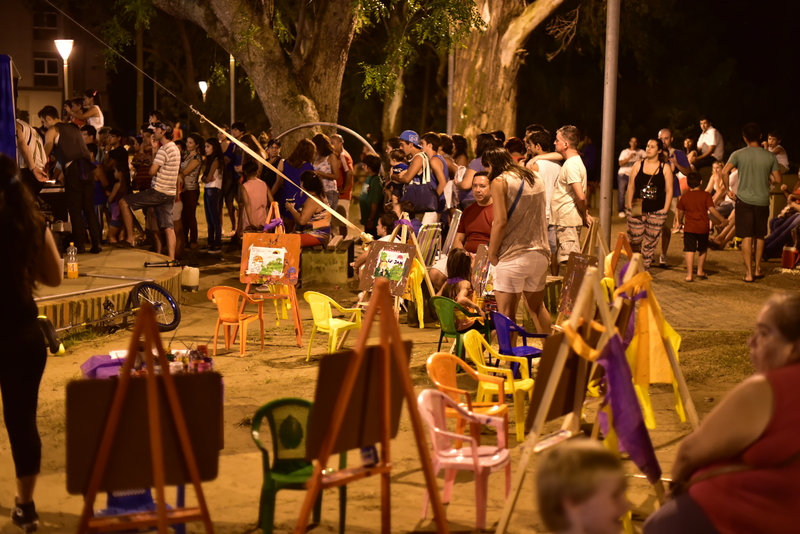 From hand-carved wooden toys to choripan to ash trays made from flattened wine bottles–there’s something there for everyone. 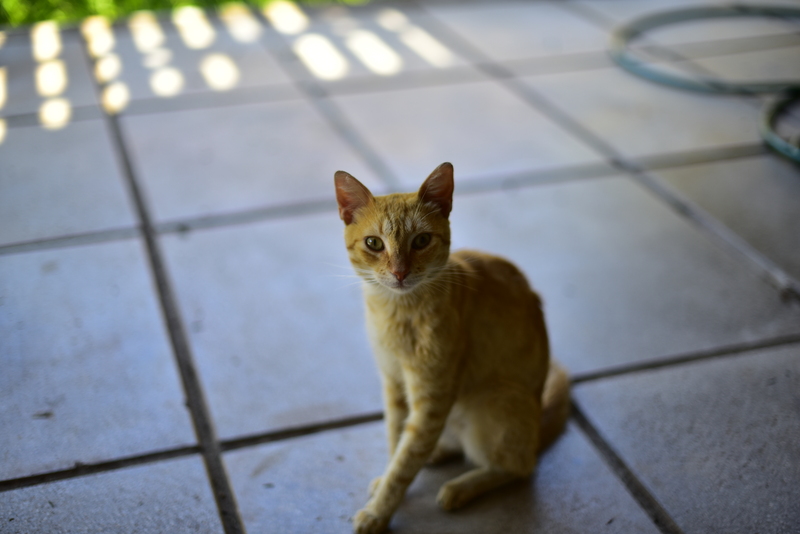 Back in November, a cat adopted us. We didn’t adopt him–he completely adopted us. 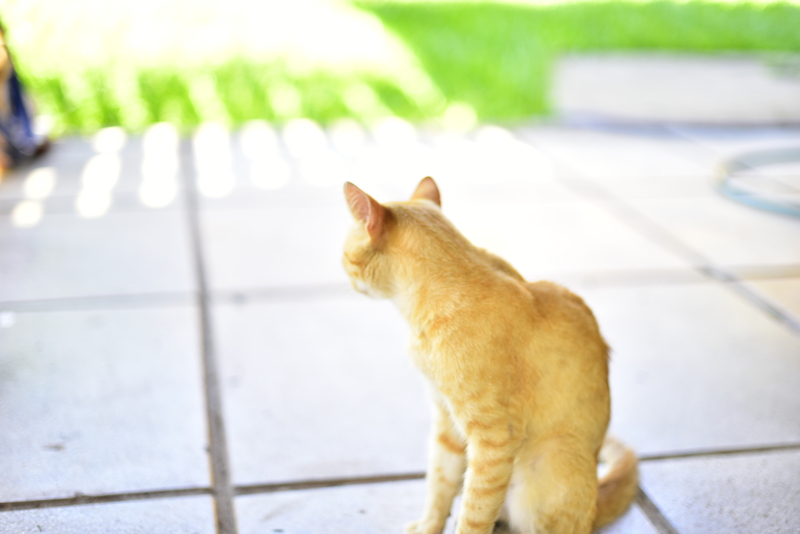 We were sitting outside, digging in the garden, when I hear a faint mewling coming from under our car. 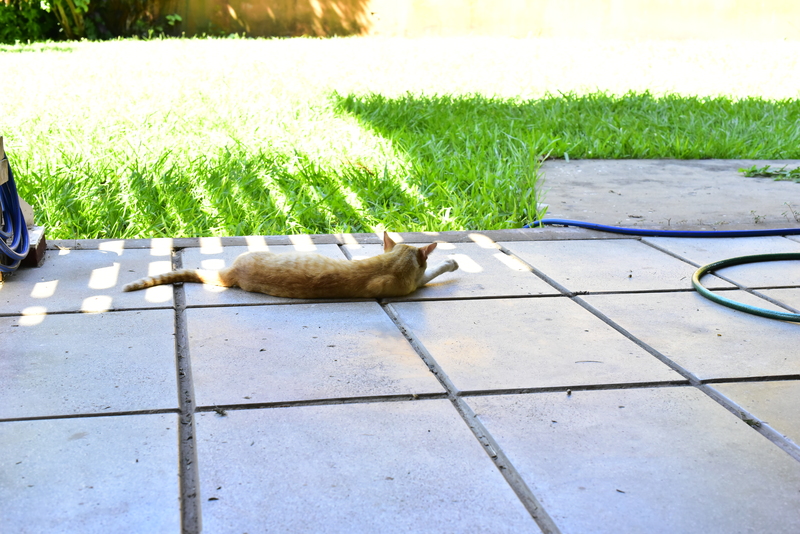 I see the skinniest orange cat ever crawl out from under and stare at us, mewling. T asked if we should feed him, and remembered we had a leftover empanada in our fridge. Twenty minutes later, I had a purring, orange fluffball in my lap giving me cat hugs. 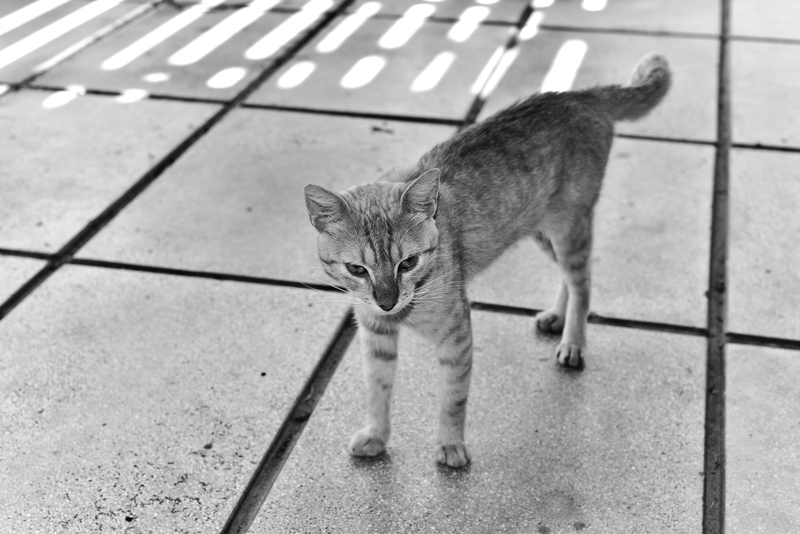 We’ve named him Mooch, because we’re pretty sure that he’s a Six Dinner Sid and he is quite insistent with mealtimes. He is absolutely an outdoor cat. T is incredibly allergic to cats, so he’s never coming in. But I think he’s cool with being an outdoor kitty. He has no urge to use the litter pan we bought (actually, it’s his naptime spot), and the only times he’s coming in the house are to run from the front door to the back door in order to expedite dinner time and when a bunch of dogs started chasing him and the nearest escape was our front door. As the months have gone by, he’s brought the family along. Fred (a girl cat we named before we realized she was very pregnant) and her two kittens (one of whom we’ve named Ferris Mewler) make an appearance, and Derf (who used to be called “Not Fred” because T has a problem distinguishing which tabby cat is which) and her two kittens also swing by the food dish. 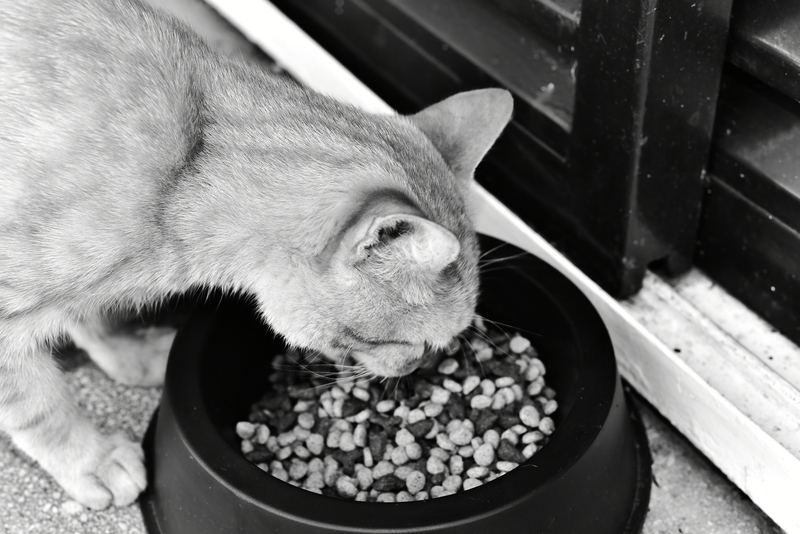 This isn’t an uncommon thing–to just place a bowl of food out, but not really “own” any of the cats. 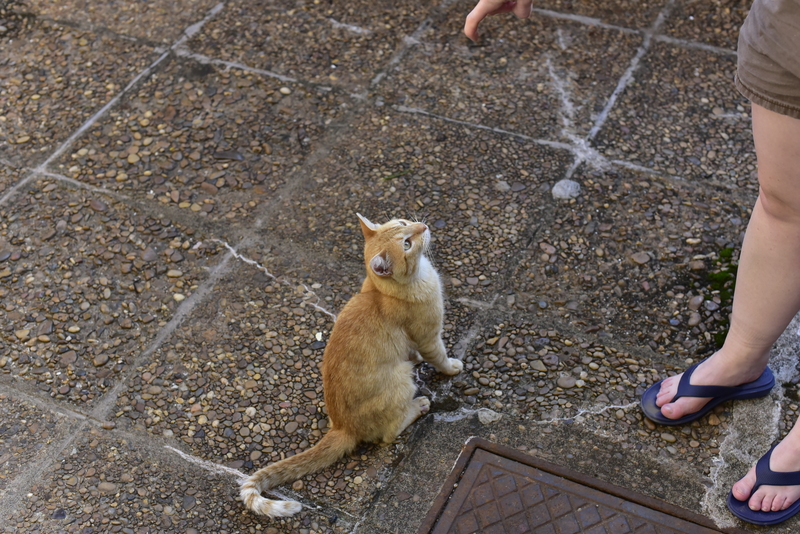 Most of the Argentinian cats we’ve encountered have been strays like Fred and Mooch. They just have their regular porches to sleep on, but aren’t terribly friendly. (Except for Mooch, who would like to be involved in everything and loves to be petted.) There’s a completely different theory about animals down here–there are no trap and release or trap and adopt measures. There’s much more of a “live and let live” feel to it. Mooch isn’t coming back with us to the States–we know that. I don’t think he would like not having the run of the neighborhood, and he’s clearly not learning litterbox etiquette anytime soon. But for now, he’s a good companion. 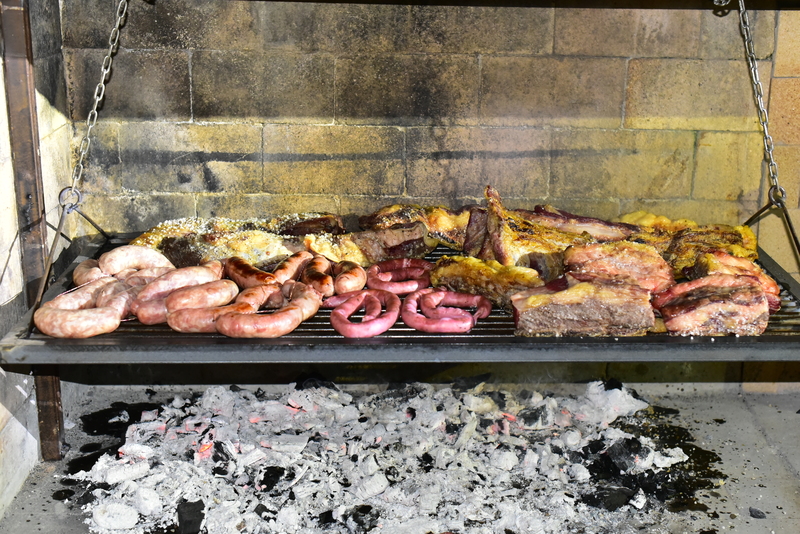 In the 13.5 months we’ve been in Argentina, we’ve been to a lot of asados (barbeques). 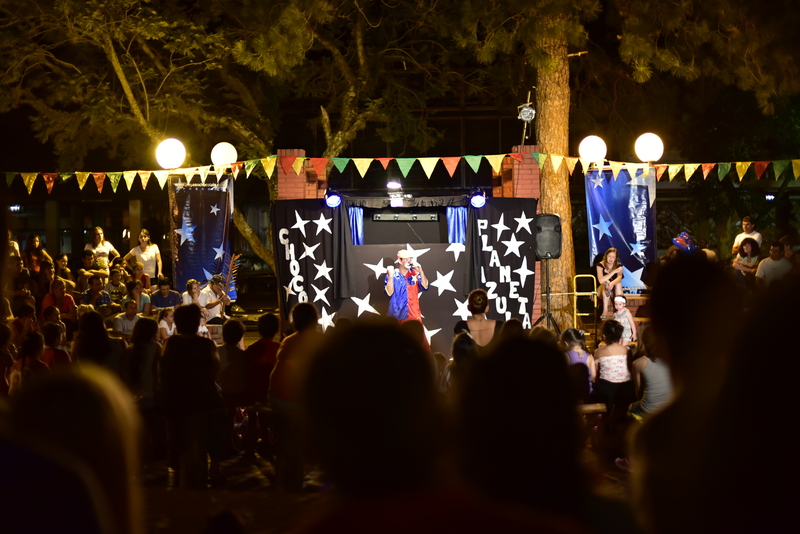 They’re such a key part of Argentinian/Paraguayan culture (especially rural culture) that it would be impossible to avoid them. Every Sunday, the entire neighborhood smells strongly of burning charcoal and roasting meat. Although we’ve previously hosted little asados just for one or two of our American guests, we hadn’t hosted our own asado yet. We decided to kick off 2015 by changing that. 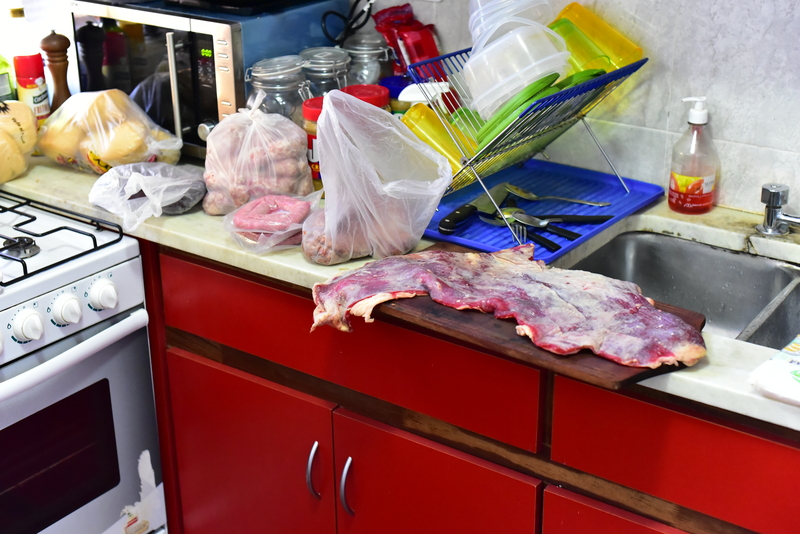 Here’s some helpful, handy tips for hosting your own asado, Argentinian-style. Chorizo–No, Americans, it’s not what you think. These are just the fat sausage links–and they are not nearly as spicy as their counterparts in American supermarket. Most often served on a roll cut in half for choripan (a mix of chorizo and pan, or bread). Morcilla–Blood sausage. Definitely an acquired taste–but we’ve found it’s better if you spread it on bread. 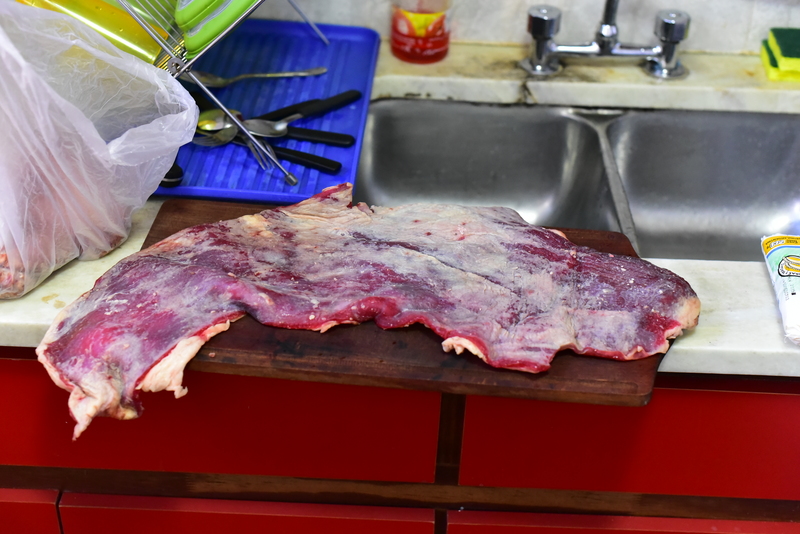 Costilla–Beef ribs. Seasoned with just a little salt. Vacio–One of the last cuts to come off of the grill, we let this flank cut slowly roast for hours to bring out the best flavors. 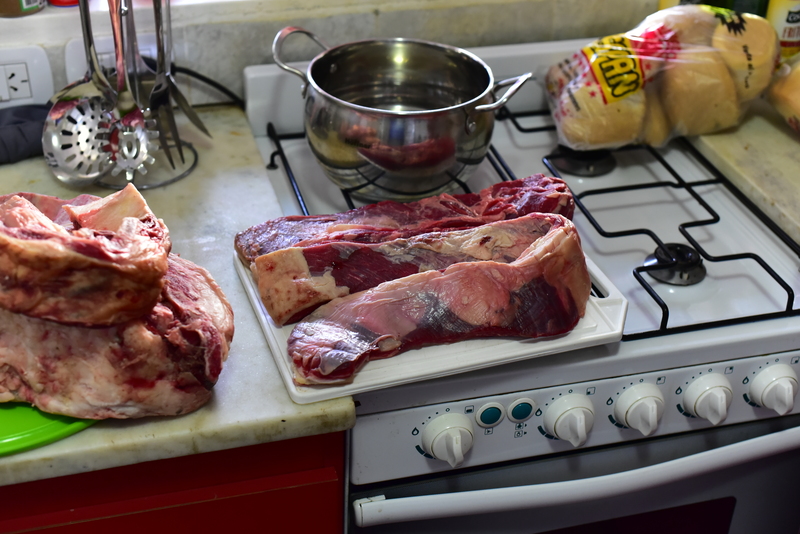 Ojo de bife–the prized cut of meat. We got this as a special addition to our asado, and it got rave reviews. 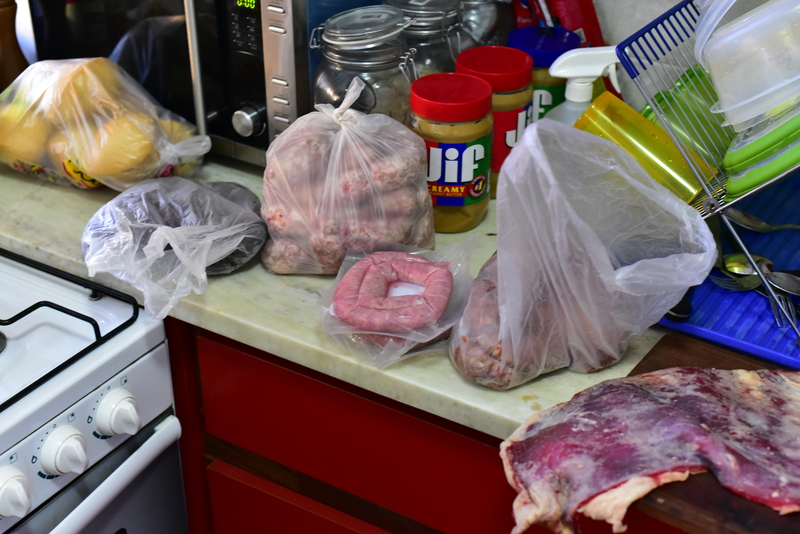 Argentinians are also fond of the “sweet meats,” or things like chincurines (small intestine) and other organs. We’re not big organ eaters, so we tend to skip these. All meats can ONLY be salted, per Argentinian standard. The addition of any other seasonings will automatically tag you as muy extranjero (very much the foreigner). When you make your fire, buy a couple bags of carbon (charcoal) at the local supermercado. They’re incredibly cheap, and this is real charcoal–no briquettes here. T uses an electric fire starter we picked up at Easy in Buenos Aires (Argentinian Home Depot–you can find them all over town, but our preferred one is in Palermo). You can also use good, old fashioned matches, but it’s all a matter of personal preference. The key to the fire is to get it good and hot, and then throw the meat onto the grill. However, Argentinian customs indicate no fire should ever touch the meet–completely contrary to US standard. 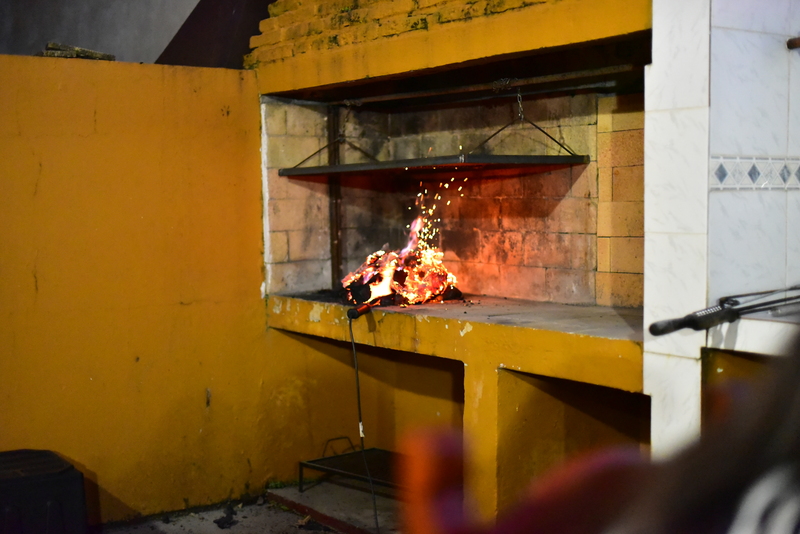 This tends to be where one of your adept (and always male) Argentinian guests will hop up and fix your grill and fire for you. In terms of those guests… invite however many people you feel comfortable with! 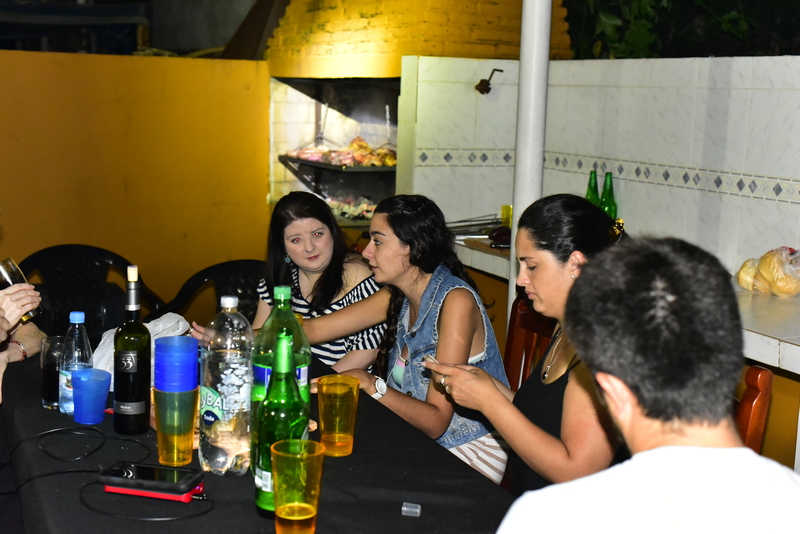 Argentinians (at least where we are) are used to sharing cups, plates, and utensils, even with strangers, at parties–so no need to really have a cup, plate, and utensils for every single person. We still try to anyway because we are muy estadounidenses and clearly have germ issues that Argentinians and Paraguayans don’t care about. Grab as many chairs as you can, and drag the dining room table to your back patio, and you’re set. The only other important thing to have is LOTS of cutting boards. The meat comes off fast and furious, and it can be difficult sometimes to find enough space for everything. In that vein, bring out a couple rolls of paper towels, and be prepared for things to get messy. We got a tablecloth to just toss in the washing machine after the party so we didn’t trash the table with all of the grease and meat juice. 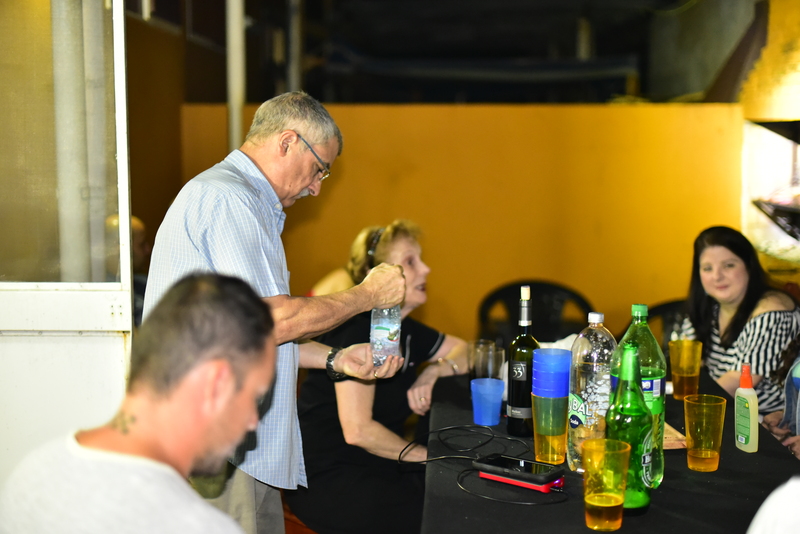 Common drinks at an asado are beer (of course–buy some Quilmes or Brahma for local options, or spring for the slightly more exotic Heineken), wine (always red, and preferably an Argentinian Malbec), Coca Cola, Sprite, and Coke and Fernet. (Fernet is an digestive liquor from Italy that is heavily used in Argentina. It’s very bitter, and one of those things we just haven’t become accustomed to. However, be aware if someone randomly hands you a glass of Coke at a party, it probably has Fernet in it too.) We try to add in some bubbly water and regular water (because, again, we’re Americans). Our first asado was deemed a rousing success. We invited all of our coworkers and their significant others and friends, and although we got a lot of help from a few friends (one of whom is a caterer, so this is his life) we think we pulled it off pretty well. We managed to make it to the 1am end time–but didn’t make it out to the club, since we were beat by then. Someday we’ll go full Argentinian and party all night until 7am like they do! One last note–give your leftovers to the neighborhood dogs and cats. If you don’t, they’ll just rip through your garbage bags for it anyway, and they’ll love you for setting out some tasty scraps.